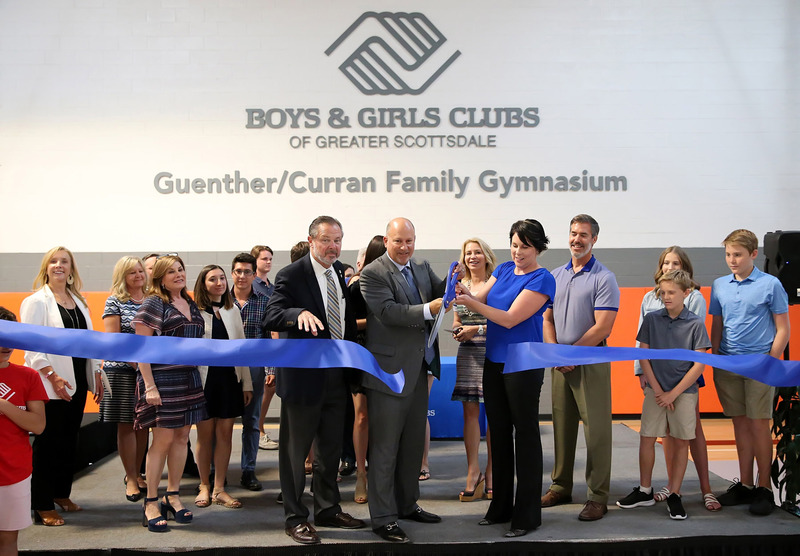 On Monday, June 4, members and families of the Thunderbirds Branch of Boys & Girls Clubs of Greater Scottsdale (BGCS) gathered with community leaders and supporters to celebrate the opening of the new Guenther/Curran Family Gymnasium and the Hilton Family Teen Center. Marianne and Glenn Guenther, who funded the Guenther/Curran Family Gymnasium, and Steve and Suzanne Hilton, benefactors of the Hilton Family Teen Center, cut the ribbon with Scottsdale Mayor Jim Lane on hand,marking the start of a new era for teens in the Grayhawk community with their own dedicated space at the Thunderbirds Branch. “When there is no teen center, staying involved in the Boys & Girls Club can become more difficult when you get older,” said Tatum Trainor, former Thunderbirds Branch Youth of the Year and BGCS Alumnus. “It is crucial to have a place where middle schoolers and high schoolers can be surrounded by members their same age, staff who are dedicated to them and programming focusing on their needs and interests.” Trainor, who hopes to become a grade school teacher, works at the Club while she is home from Northern Arizona University for the summer. Teen Club members now have their own entrance to the gymnasium and teen center that includes a fitness center, games room, teen lounge, kitchen, technology center and performing arts room. The 12,624 square foot addition to the Thunderbirds Branch will allow the Club to serve 200 more kids and teens on a daily basis. The Thunderbirds Branch has already seen an increase in teen membership since opening the new teen center and gym doors last month. Bollinger Consulting Architects designed the new facilities built by Hardison/Downey Construction, Inc.